Rockford Map Publishers produces high-quality custom aerial wall maps that show your property or any other area of land you are interested in. These custom wall maps are created from scratch and based on each customer’s specific request, which means each map is one-of-a-kind! To begin, our custom mapping specialists work with you to determine what is the best scale and size to display the requested land area. 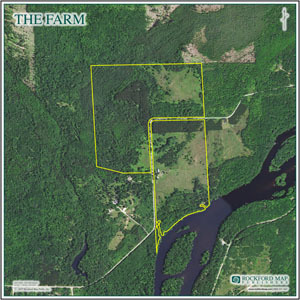 We then collect the most current, high-resolution aerial imagery available from the USDA to utilize in your custom map. Once the base layer is set, we can overlay additional map information. This additional map data can be anything from parcel boundaries, roadways, waterways, landownership information, district boundaries, titles, and more. We have access to a wealth of GIS data and have heard every request you can possibly think of. If there is something specific you want mapped, just ask and we’ll see what we can do! 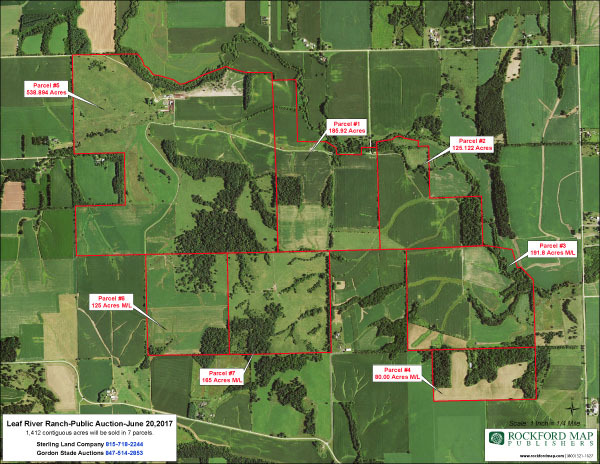 Whether you want to scout new hunting areas, examine the terrain, or simply want to highlight your property, these maps offer a great overview of the land. Next, once your aerial wall map is created, we send you a proof for review and then it is on to printing. All our custom aerial wall maps are printed in full-color. This allows you to see exactly what the land looks like from above. Generally, a 2’ x 2’ map is sufficient for most properties, but we can always make it larger if needed. Finally, we laminate these maps to provide protection and provide hanging bars, so you can easily mount the map on your wall. The hanging bars and lamination can be left off the order if you would like to frame the map on your own. Our newest aerial map features a 3D effect. This effect allows you to visually see the elevation change opposed to our traditional, flat aerial maps. This option looks the best on larger areas with lots of elevation change. Our custom mapping specialists will be able to let you know if this feature is worthwhile for your specific map. A custom aerial wall map is a great way to showcase the land that you own. Are you an auction, real estate or land sales professional? 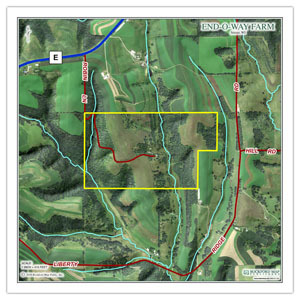 An aerial wall map can be an effective marketing tool when promoting land sales. Do you have customers who own land? These types of maps make great gifts for your preferred customers and leave a lasting impression. We at Rockford Map Publishers have the resources, data, and artistic talent to create custom maps to meet all your mapping needs. We love to think outside the box and our custom mapping specialists are ready to hear your ideas. We’ve created custom maps for routing, planning, tracking, reporting, recreation, soil composition, and much more. Whether it’s for business purposes, personal use or just for fun, Rockford Map can create the right map for you. Visit our custom maps page to view more samples and request a quote.